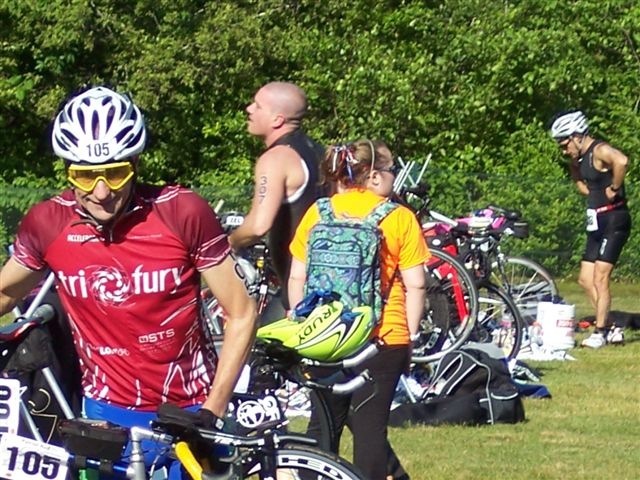 After almost three years attempting to get in, I finally was able to successfully sign up, train, and complete my first half iron triathlon. Sun Multisports’ “Patriot Half” was a great first half experience, and I’m already looking forward to doing it again next year. I want to thank everyone in TriFury who gave me advice, suggestions and encouragement, it all really helped. Here are my thoughts, experiences, observations and planned corrections for next year. With Freetown looking to be a two hour or more drive from home, I told Joyce I might like to stay there the night before rather than drive that long, that early in the morning and then attempt my first half iron race. Remembering how I arrived home last October after my first full marathon (Bay State), she not only agreed but also insisted I get the room for two nights so I could immediately rest rather than try to drive back. (Last October, I had to call George out to the garage to untie my shoes, as I couldn’t even do that much after the race.) I found what appeared to be a good, inexpensive room through hotels.com (not one of the race recommended hotels), and booked it for two nights. With the room booked, I was planning on picking up my packet Friday afternoon, followed by setting up my equipment that evening in the hotel for the race. I loaded my car Thursday night, went to work in Woburn Friday morning, and then left that afternoon at 4:30 to drive to Freetown. My Garmin indicated it should take just over an hour, and directed me onto ’93 south. One hour later, the pack crawled into Medford, where the traffic really started getting heavy. 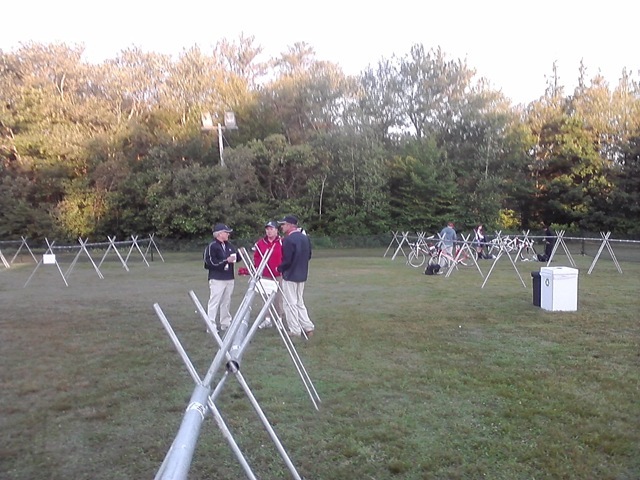 I finally pulled into Cathedral Camp at 7:35, hoping there would be some chance packet pickup, scheduled to only go until 7:00, would still be open. A volunteer directed me to a building down by the lake, where I saw one person emerge with a plastic bag. Running in, I encountered two other volunteers debating who had the door key so they could lock up. After explaining the traffic situation, I was given my packet, shirt and hat, for which I thanked them profusely. 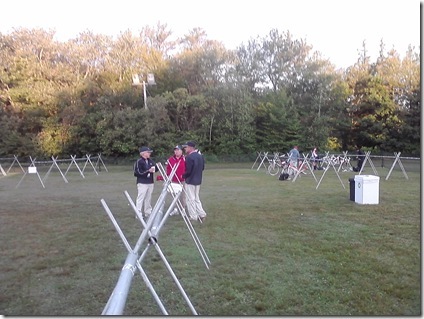 Throughout the weekend, every Sun Multisport volunteer I met was incredibly helpful. The drive from Cathedral Camp to the hotel I booked in Somerset was short, and I was looking forward to unpacking and getting a good night sleep. As I drove up to the hotel, I noticed a good number of families hanging out on the balconies and walkways, with kids playing in the parking lot and loud music from several music boxes. Feeling a bit apprehensive, I parked and went into the office. The desk clerk was apologetic, and said they had been overbooked by the DTA and I had been moved to another hotel across the river. Driving back across the river, I reached the Quality Inn & Suites. No loud music, no groups of people hanging out, and several cars with USAT stickers and empty bike racks were in the parking lot. Good luck had once again smiled at me, as this was a clean, quiet hotel promising a good night sleep. I know I brought than necessary, but as there is no penalty for bringing too much, I figured I would rather have it, and not need it, than the other way around. The amount of food (if you can call Gu food) I had brought still surprised and unnerved me. Reading and listening to others over the previous six months, the number of calories required per hour seemed to be all over the place. Don’t ask me how, but I finally decided that 300 cal/hr would be needed, or the equivalent of one Gu pack every 20 minutes. I would also need to go through at least one bottle of water and one bottle of electrolyte solution in the first half, and most of two more in the second half. The Fig Newtons, Ritz crackers, salt capsules and three packs of Gu went into the top tube pouch, and I left the rest of the Gu packs on the towel. After having a couple Fig Newtons, I got the wetsuit on and prepared for the swim. A stiff breeze was blowing in from the north-northeast, coming nearly straight down the length of Long Pond towards Cathedral Camp. The photograph shows what we used to call in Florida ‘six inch ankle snappers’. Not quite big enough for surfing, but big enough to make swimming interesting. A long line of bright orange buoys stretched northwards, and I picked out a few landmarks on the opposite shore to aim towards. I was in the fifth wave, with exactly half the field starting ahead of me and the other half behind me. The water temperature was nice, as I was worried it might be a bit too warm given the warm temperatures we had been having. We started, and I tried to concentrate on keeping a steady stroke and a good fix on the next buoy and landmarks I had picked out. 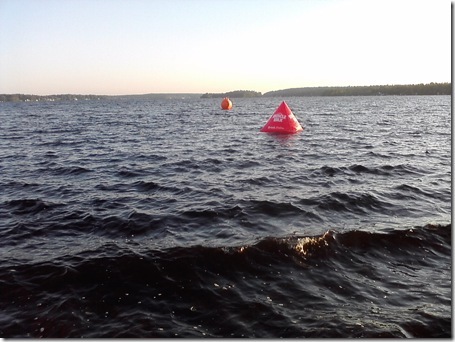 Overall, the chop was the worst part of the swim, as it made it impossible to sight more than one buoy. In fact, one time I thought I was off course, and started swimming towards what I thought was the next orange buoy. As I approached, I noticed the buoy was also moving towards me. It turned out that the ‘buoy’ I had sighed on was a lifeguard in an orange shirt on a kayak. He asked if I was all right, and I replied great but just having trouble seeing over the chop. Several times, I found myself swimming alone, and had to stop, tread water hard to lift my head above the chop, and get back on course. The lifeguards were always within sight, and a couple times were approaching as if to offer assistance. Always a comforting thought knowing that they are out there watching out for us. I finally started touching the bottom, stood up, and walked out of the lake and into transition. 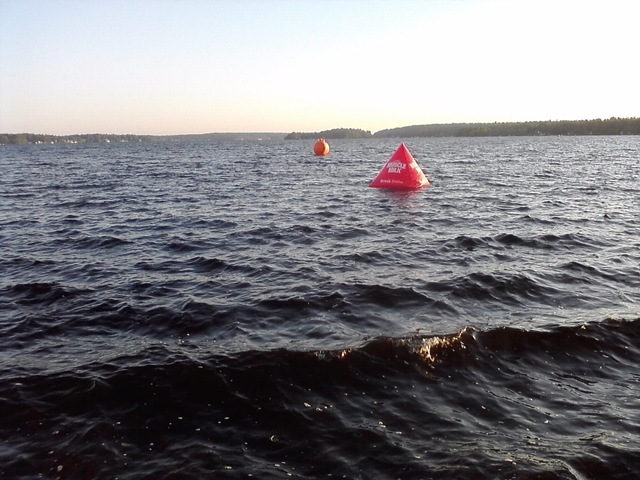 My swim time was recorded at 47:09, coming out of the water 481 out of 611. Overall, not too different than my usual (slow) swim times, this was fine as I came out relatively calm, not exhausted, and ready for the ride. Half jogging and half walking out of the lake, I told myself to slow down as a long bike ride was ahead. 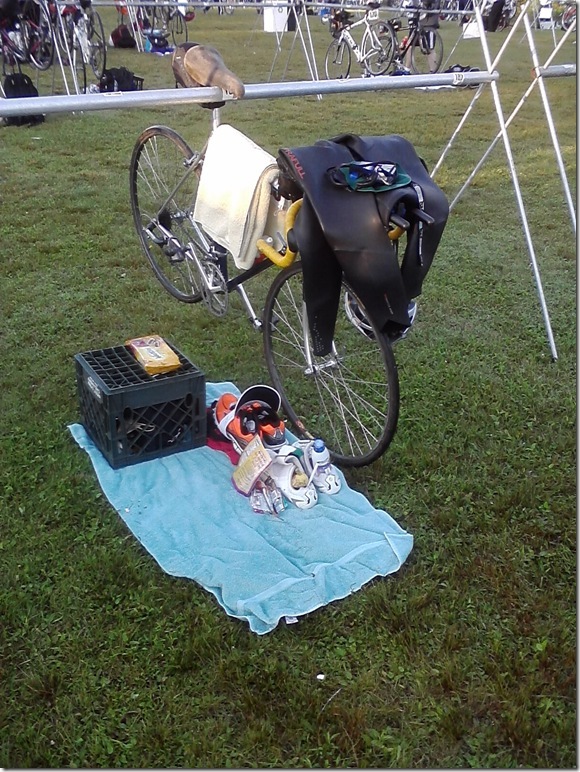 I had planned to take my time in T1, ensure I had everything set for the ride and not rush through and forget something. I got the rest of my wet suit off, then took my time drying off, especially my feet. I put my socks on, then cycling shoes, then picked up the rest of the Gu packs and put them in my back pocket. Checked that the tires were still good, and then put on my cycling gloves, glasses and helmet. I hadn’t worn the gloves in a race since my first year, or the glasses in any race, but decided to use them for this race. (I even got an erstwhile complement on the glasses; someone remarked how they remembered them from the 80’s – which is when I bought them.) I then sent a text message to my wife that I was out of the water and getting ready to go off on the bike. (I had saved two draft messages the night before for T1 and T2.) Finally, I sprayed myself down with sunscreen. Mounting the bike and hitting “Start” on the Garmin, I left the camp and started down the road. I had configured my Garmin to display the two parameters I decided were important on the ride: my heart rate and cadence. Based on various reading and a lecture from Mark Allen, I determined that I needed to keep my heart rate in the 130 – 135 bpm range. And from experience in cycling, I knew that I needed to keep my cadence around 90 rpm. The ride was pleasant, winding around the lake with mostly little traffic. I started out having one of the Gu’s or a few Fig Newtons every 20 minutes or so, along with the water and electrolyte solution. I came up on and passed the first bottle exchange station at mile ~13, without needing a refill. I didn’t worry, as I had planned on having enough to take me to the second station. By the time I reached the second bottle exchange, my water bottle was empty and I needed to stop there to use the ‘facilities’. Although it clearly added to my time, I told myself at least I was keeping properly hydrated. I continued on, and traded my now empty electrolyte bottle for a new one at the third bottle exchange. I was mostly keeping to my plan, keeping my cadence right around 90 and my heart rate around 135. I didn’t keep track, but it seemed there were more cyclists passing me than I passed. I didn’t pay too much attention to my speed, as I kept telling myself keeping in the proper HR range was more important than trying to maintain a given (i.e. too fast) speed. After having multiple packs of Gu and finishing the Newtons, I really started craving the Ritz crackers. While the Gu may be the ‘optimal’ mixture of sugars for absorption, the taste and texture starts out as barely palatable and soon becomes almost inedible. I held off on having the crackers until 40 minutes into the second hour of the ride, then inhaled the entire baggie along with shots of water and electrolyte solution. Revived by the slightly salty crackers, the rest of the ride went well. Passing the final bottle exchange / potty station, I decided I could wait until I got to T2 to use the ‘facilities’ a second time. Turning into Cathedral Camp, I tried to get my shoes to unclip while maintaining balance on the rough pavement. Approaching the dismount line, my shoes were still tightly clipped in and refused to release. I stopped, gave one last yank and my shoe finally popped free. I hit the lap button on the Garmin, got my other shoe free, and trotted into T2. 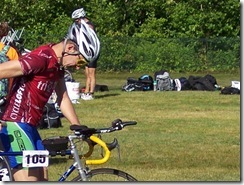 My total time for the 56 miles was 3:26:51, finishing 516 out of 604. 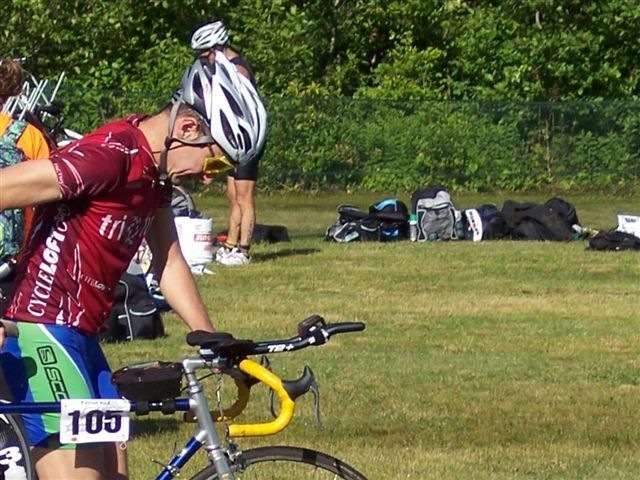 This race was the first time I slipped back in the pack, as I usually make up my slow swim times on the bike. Averaging 16.2 mph over the ride, I was able to keep my heart rate average at the upper end of the target range at 135 bpm. After I racked my bike, I sent my wife the second text message that I was off the bike and preparing for the run. I sat down, removed my helmet, goggles, gloves and cycling shoes. I had a last shot of the electrolyte solution, and then tied on my running shoes. Yes, tied – again I had decided to trade transition speed to ensure my shoes were on right and comfortable. Testing them, I then put on my race belt, transferred the Garmin from my bike to my wrist, grabbed my hat and trotted towards the exit of transition. Total time in T2: 4:55. Again, not fast, but comfortable I had everything ready for the run. Exiting transition, I hit the lap button on the Garmin. The Garmin gave a distinct series of beeps and the display reported “Multisport Complete”. Realizing I must have hit the lap button twice going into T2, I frantically pushed buttons to reconfigure for a regular run. As I completed this, I came upon the set of porta-potties just beyond the exit of transition, saw one runner emerge with no one waiting in line. Quickly I jumped in, took care of what needed taking care of (hydration was clearly working well), emerged and started down the road on the run. The first part of the run went well, I kept reminding myself to slow down and not spend it all in the first few miles. The first part of the run was mostly shady. 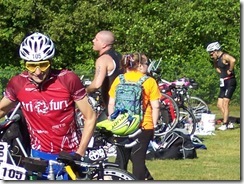 I took Paul’s advice, and walked through the aid stations, taking a water or electrolyte drink each time. The first three aid stations went by quickly. After the third, I checked my Garmin, which reported an elapsed time of “0:00:00”. I cursed myself for forgetting to hit the “Start” button, started it anyway, and learned that the Garmin will happily report your pace time without recording elapsed time. I continued to walk and sip my way through the next few aid stations, until my stomach started telling me that it had had enough thank you. I started skipping every other aid station, and the shade on the first part of the run disappeared. I felt good through most of the next three miles, and found myself playing ‘tag’ with one runner who also would stop at every other aid station. I’d pass her at one station, she would pass me at the next. We continued this up past mile 11, occasionally exchanging pleasantries, up until the aid station at mile 12 was in sight. She turned back to me and said “O.K., let’s really kick this last mile” and took off. I shouted back “Great!”, my legs growled “You’re dreaming”, and I continued a slow trot down the road. That last mile seemed as long as the first 12, with the now hot sun blazing, and the line of cars on the road adding their heat and exhaust fumes. I turned into Cathedral Camp, and started searching for the finish line. I ran down the entrance drive, almost into the lake, and then turned to go along the lake. I briefly had a vision/nightmare about having to run all the way around the lake, and then saw the last turn and the finish arch. Passing under the arch, I was handed an ice cold bottle of water, a towel soaked in ice cold water, and a finisher’s medal. I finished the run in 1:56:55, with an average pace of 8:55 placing me 223 out of 596 runners. Overall, I finished in 6:24:20, 426 out of 596 finishers and 18th out of 23 in the men’s 55-59 age group. I gave Joyce a call to let her and the kids know I finished, then returned to the finish area for the post-race festivities. Post-race festivities were extensive, with plenty of cold drinks, hot food, music, massages, vendors and general merriment for all. I remained a while for food, refreshment and the awards ceremony, then gathered up my stuff and returned to the hotel for a long shower, nap, dinner and an early bedtime. 1 – not drive through Boston on a Friday afternoon. If I decide to spend the night before there, I’ll leave very early afternoon at the latest and drive around on 128 or 495. 2 – not book through Hotels.com, assuming I stay overnight at all. If you want to stay overnight, and don’t want or can’t get in the recommended hotels, the Quality Inn and Suites in Fall River an excellent choice. 3 – bring just as much stuff for my site in transition. Until USAT starts assessing a penalty for excessive ‘stuff’, I’ll be more comfortable having and not needing than the other way around. 4 – cut down my time in transition. As most of what I’ll need on the bike and run will be on me, my bike or run belt, I shouldn’t have to stop to take inventory. I will also run a half or two with speed laces before next year’s Patriot, to see if they will work well enough for a half-marathon. Five minute transitions will be out. 5 – bring more light crackers on the bike, such as Ritz, along with some other selected (and to be determined) food. Gu and Fig Newtons alone quickly become inedible. 6 – go a bit harder on the bike. Given the strong run I had, I now know I should be able to push it a bit more on the bike. I’m not sure what heart rate to target, but will be working on that this coming winter and spring. 7 – set up the Garmin with a quick-mount system, and ensure the display is on multisport when approaching T2. While not affecting my official race time, I like having a complete race recorded rather than parts. 8 – ensure the bike cleats release properly when needed. I was racing almost-new cleats this year, and will work with them to ensure they release when I want them next year. 9 – bring some crackers and Gu on the run. I had thought there would be some at the aid stations, but I only found orange slices (which I know from experience upset my stomach). 10 – add packs for the Ritz-type crackers to my bike and run belt. Joyce has already made one pack for between the aero bars, large enough to hold a banana and almost a whole tube of Ritz crackers, she said she will make something to hold a small handful of crackers on the race belt without turning them to dust.